The Volta a Catalunya is the oldest stage race in Spain, and among the longest running in Europe. So it’s only apt that for its 95th edition the week-long race around Spain’s Catalunya region is drawing a top field. Defending champion Joaquim Rodríguez (Katusha) won’t be back due to illness, but the race, which opens Monday in Calella and ends Sunday in Barcelona, features a top-notch start list that will only be rivaled by the Tour de France in July. Alberto Contador (Tinkoff-Saxo) and Chris Froome (Sky) will pick up their growing rivalry. The two last locked horns at the Ruta del Sol in February. But both Nairo Quintana (Movistar) and Vincenzo Nibali (Astana) are giving the Volta a miss. Still, the start list includes no shortage of big names, such as Paris-Nice winner Richie Porte (Sky); Tejay van Garderen (BMC Racing), who won a stage last year; Fabio Aru (Astana); Rigoberto Urán (Etixx-Quick-Step); former winner Dan Martin and Ryder Hesjedal (Cannondale-Garmin); Warren Barguil (Giant-Alpecin); Alejandro Valverde (Movistar); and Romain Bardet (Ag2r-La Mondiale). With so many big names, it’s hard to say who will be gunning to win. Defending champ Rodríguez has a flu bug, and said he hopes to return to action in time for the Vuelta al País Vasco (Tour of the Basque Country) in early April. Contador also confirmed he will start, but said he is likewise unwell and might not be firing at all cylinders after taking fifth at Tirreno-Adriatico earlier this month. “I’ve caught a little cold from the two wet stages in Italy with snow and rain, but I hope that I will able to start the race fully recovered. My ambition is to secure a good result, while continuing to build my form ahead of my first main objective, which is of course the Giro,” Contador said in a team release. 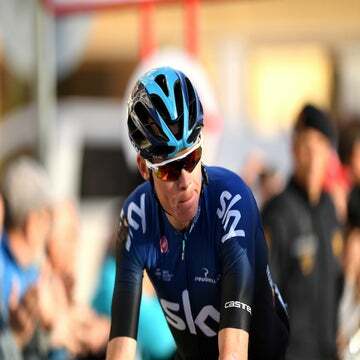 Froome was forced to miss Tirreno-Adriatico earlier this month, also due to illness, so he’s somewhat of an enigma. Porte, hot off an impressive victory at Paris-Nice, could take over leadership if Froome is not up for the fight. Cannondale-Garmin’s Martin won the overall in 2013, thanks to big help from Hesjedal. Both are back for their “home race” — they live in Girona — and both used Tirreno to prepare for Catalunya as well as the looming Ardennes classics. Van Garderen, third overall last year, will be looking to improve on his showing in Paris-Nice, where he couldn’t match Porte in the decisive stages. The always-consistent Valverde, who won in 2009, will be a factor for the GC. But as Contador hinted, it will all come down to one decisive climb at La Molina, and whoever has the legs on the day. Much like last week’s Tirreno-Adriatico, the Volta’s course doesn’t quite live up to its roster. With so many marquee names, it would be nice to see more uphill finales, but organizers have delivered a moderate route for 2015. One reason is recent bouts with bad weather that have forced cancellation of some stages due to snow and cold; this year, with exception of the La Molina climb, the route hugs lower altitudes. That doesn’t mean there’s a shortage of climbs, and the top teams will still have to do some heavy lifting to keep the race under control. Stage 1, starting and finishing in Calella, serves up the steep, first-category Alt de Coll Formic with 55km to go; sprinters will find it tough to get over with the front group. And a third-category climb with 15km remaining could see anyone off top form getting dropped on the first day. Stage 2 to Olot features rolling terrain, with a sharp kicker in the finale, ideal for the puncheurs in the pack. Stage 3 to Girona, the European home base for so many pros, tackles the Cat. 1 Alt dels Angels, a favorite local climb, twice in the second half of the route. Stage 4 features the Volta’s only uphill finale, to La Molina ski area. The climb is neither terribly steep nor very long (12km at 4.8 percent), so the GC could well remain very tight heading into the final stages. Stages 5 and 6 feature some lumpy terrain, so the sprinters and breakaway riders will have their chances. The finale in Barcelona features eight trips over the Cat. 3 Alt de Montjuic climb, which could provoke some attacking if the GC remains tight. In the absence of time trials, time bonuses (10, 6, and 4 at the line, and 3, 2, and 1 intermediate) could well decide the overall. The Volta is the fourth-oldest stage race in Europe. It was started in 1911, and will enter its 95th edition this season. Only the Tour de France (1903), Tour of Belgium (1908), and Giro d’Italia (1909) are older. In contrast, the Vuelta a España wasn’t started until 1935. Miguel Indurain holds the record with four overall titles. The race has bounced around on the calendar, running before in June and May. Its latest move, slotting into late March, fits in well with riders looking to sharpen form ahead of the Ardennes and Giro. This week could well see one of the lieutenants take their chances, at least at Sky and Tinkoff-Saxo. 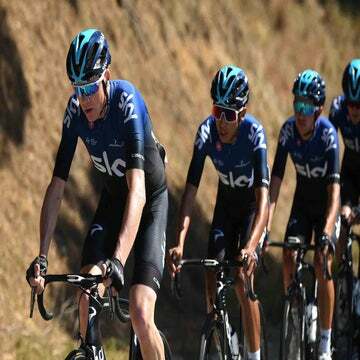 Porte is clearly on good form, and may well take the reins if Froome is feeling a touch short of race kilometers or does not want to take risks. The same goes for Tinkoff-Saxo, where Rafal Majka will be keen to make up for disappointment at Paris-Nice. If Contador is feeling a touch under the weather, he will not do anything to jeopardize his health ahead of his run at the Giro-Tour double later this season, and the door could open for Majka. Aussie sprint phenom Caleb Ewan (Orica-GreenEdge) will be making his 2015 WorldTour debut. Many are calling him the best Australian sprinter in a generation, and he’s already picked up his first pro wins, with two stages at the Herald Sun Tour and two more at the Tour of Langkawi. He’ll have to show off some climbing legs to be in the mix for the sprints in the challenging Catalunya course, but Orica has high hopes for the 20-year-old. Wilco Kelderman (LottoNL-Jumbo) is building toward his Tour de France debut in July, but the Ardennes are early season goals, so the tall, feisty Dutchman will be in fine form this week. With time bonuses proving decisive, Kelderman’s strong finishing kick could put him in the running for a podium spot.